What is Sun is Life Training? Sun is Life Training is the indoor tanning industry’s Premier Training Program – unlike any other training program available! AND … Sun is Life offers the recognition of the Guest Experience Medallion (GEM). 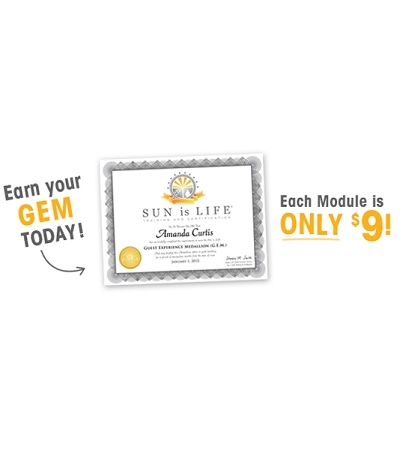 Successful completion of all 25 courses automatically earns you the Sun is Life GEM designation … the industry’s new gold standard for tanning salon professionals.